Moose FM Cochrane and Iroquois Falls have never participated in a project with a fundraising goal of one-hundred-thousand dollars… until now. 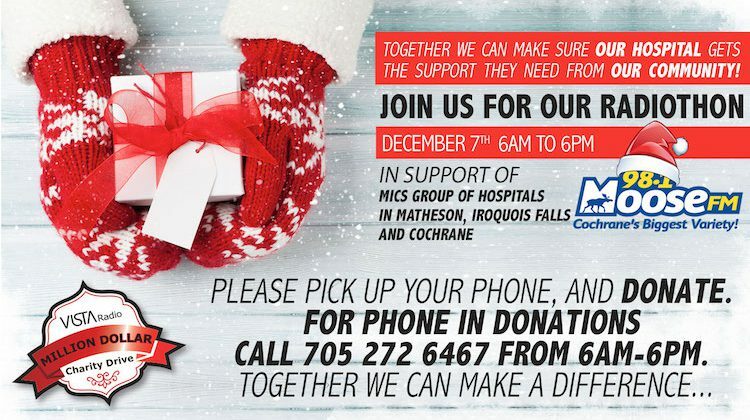 Friday’s Caring Communities Radiothon runs from 6:00am until 6:00pm on Moose FM. A hundred-grand is the goal, to help the hospitals in Cochrane, the Falls and Matheson buy portable digital X-ray equipment. Lady Minto Hospital board chair Pat Dorff acknowledges it’s an ambitious goal… but is confident it can be reached. In Dorff’s estimation, it’s important for everyone in the three communities to donate, because the hospitals do all they can to help people.